If one were to judge these essays in terms of price, their value would be very high. At her best (and worst) Miss Sontag offers three pennies worth of thought in any one sentence. "The function of criticism should be to show how it is what it is, even that it is what it is, rather than to show what it means." Wonderful. And she drops names like dandruff. The classic example is a classic of her own. "Notes on 'Camp'." With epigraphs from Wilde, and random examples of the Camp "sensibility" (King Kong, Swan Lake, and the memorable "stag movies seen without lust"), Miss Sontag concludes: "The ultimate Camp statement: it's good because it's awful...but one can't always say that. Only under certain conditions, which I've tried to sketch in these notes." (Did she mean stretch?) Anyway, Miss Sontag's method is an entertaining mixture of sheer assertion, phenomenology, deep-think, and gush. On Levi-Strauss, Camus, Leiris, and The Deputy, she's brilliant; on the films of Bresson fine; on those of Goddard, Resnais, and Jack Smith a little drippy. Her "Going to Theatre" pieces usually go to pieces; the Marat/Sade coverage, however, is excellent. She fumbles with Sartre and Ionesco, and her long tribute to the radical art of "Happenings" is a propagandistic hullabaloo. Her three theory-essays (the title one, "On Style," and "On Culture") are maddeningly uneven. 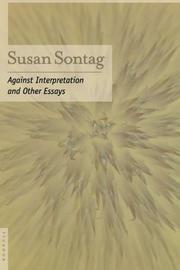 Like a Joan of Arc of the avant-garde, Miss Sontag attempts a critical breakthrough. Now and then, she succeeds. In any case, controversial "must" reading.